At this time of the year cycling takes a bit of a backseat, but I’m still able to clock up quite a few winter miles. Every mile helping to boost that very long term project of improved fitness for 2015. If you’re wanting a quick fitness fix and noticeable improvements in form, winter miles are a very hard and slow way of going about it. Every time I go out, there is part of me which thinks – it wouldn’t really matter if you missed today. But, then there is the other part of me which thinks, if I do 50 miles today, perhaps that will knock 2 seconds off a 100 mile time trial time in July. Fortunately, I would be out cycling even if I never planned to race in 2015. 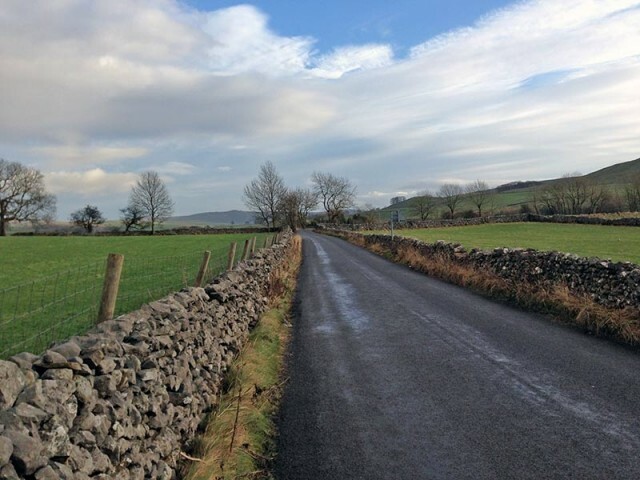 I’m happy to clock up the miles for the sake of cycling – rather than as a means to an end. 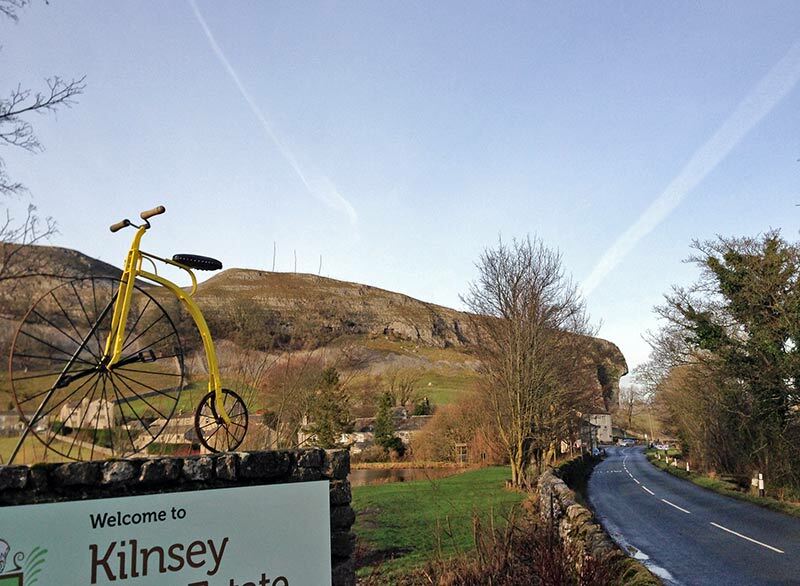 Today was a steady 60 miles towards Kilnsey Crag and Littondale; in terms of enjoyment it was one of the best rides of the year. I could get used to being a cycle tourist. 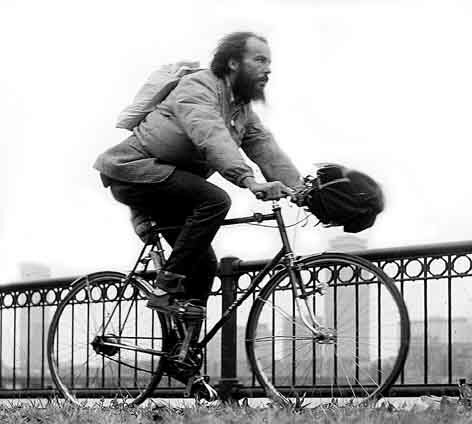 Perhaps I could grow a beard and get a touring bike with proper mudguards – not these lightweight, aerodynamic, clip on ‘I’m a racer at heart’ type mudguards jobs. 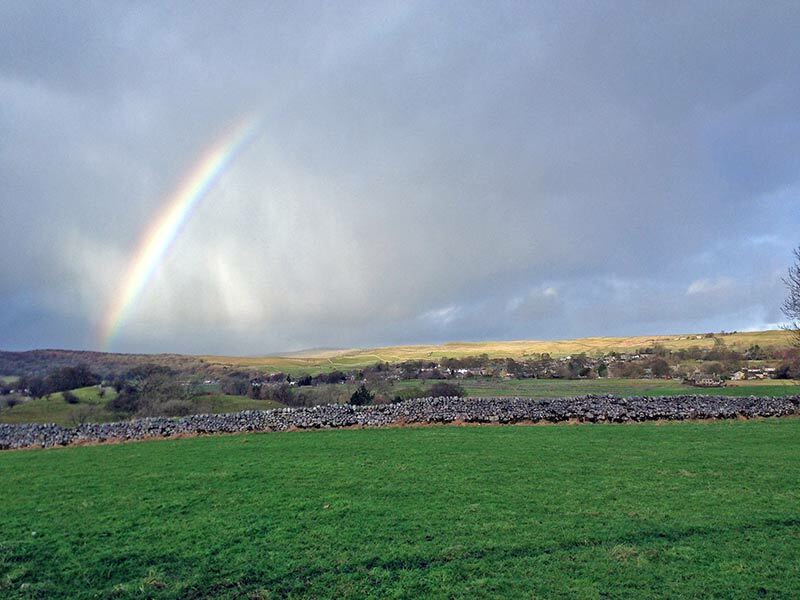 The weather is remarkably good for December in Yorkshire. Just 6 degrees, but warm enough to make it pleasant; and dry. Of course – when I say dry – I mean the absence of rain. There’s still enough water on the road to get soaked through – especially when you leave your front clip on mudguards in Oxford. I arrived in Yorkshire with minimal packing. I didn’t pack any cycling energy bars, so have been relying on ‘normal’ food that you might find in the kitchen. It’s amazing that, to cycle, you don’t actually have to spend a small fortune on proprietary cycling bars. I found a honey sandwich was enough to get from Bursnall to Halton Gill. Yes, it made me feel like a real cycling tourist to be eating kit-kats and honey sandwiches. For mid-winter, I’m in pretty good shape. I managed close to 900 miles in November. The hours spent is even more impressive. If I spent that time on a time trial bike on the A50, I could have done twice the mileage. I have an old saying ‘Yorkshire winter miles count double.’ Because it can all be painfully slow at this time of the year. But today I managed to keep a reasonably impressive average speed; and as the light began to fade, I upped the effort to get back before it was really dark. Four hours on the road, 60 miles on the log. The whole ride was pretty undramatic. I would like to say the roads were exceptionally quiet – they were in places, though in recent years I’ve noticed a big increase in Yodel and white vans, making frantic last minute Christmas deliveries. I know the convenience of internet delivery is very useful, but for the cyclist trying to enjoy quiet roads, it’s not the best development. Still that’s the only complaint. 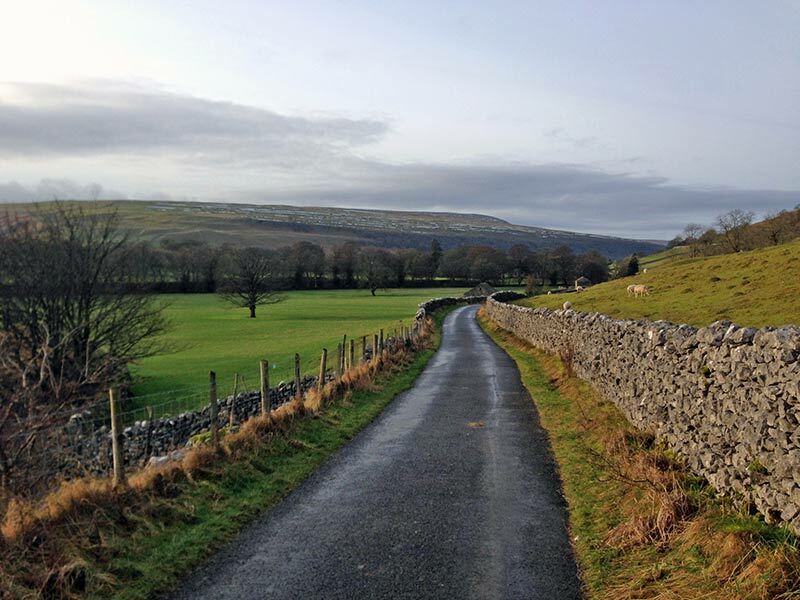 Mostly it was enjoying the Yorkshire Dales scenery and clocking all those all important miles for the winter mileage saving bank. If I get to 700 miles by the 25th, I might give myself Christmas Day off. 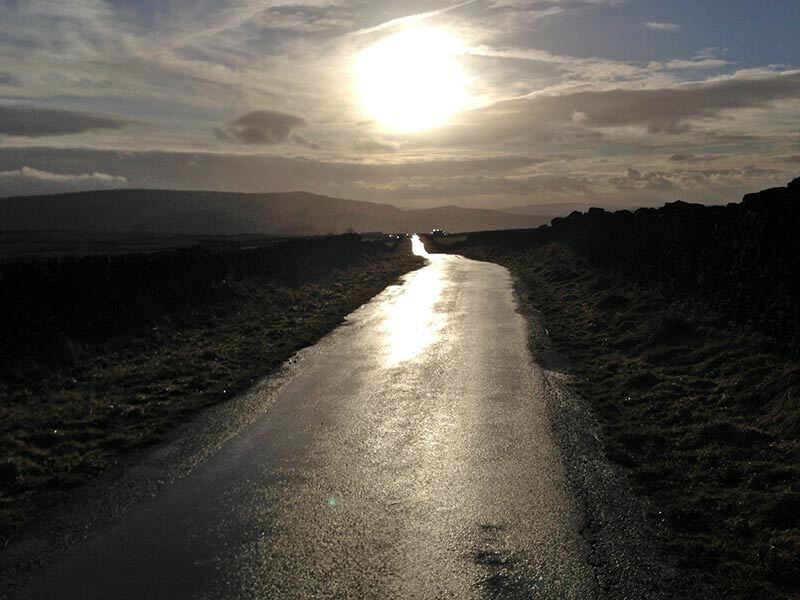 Low level sun near Grassington. 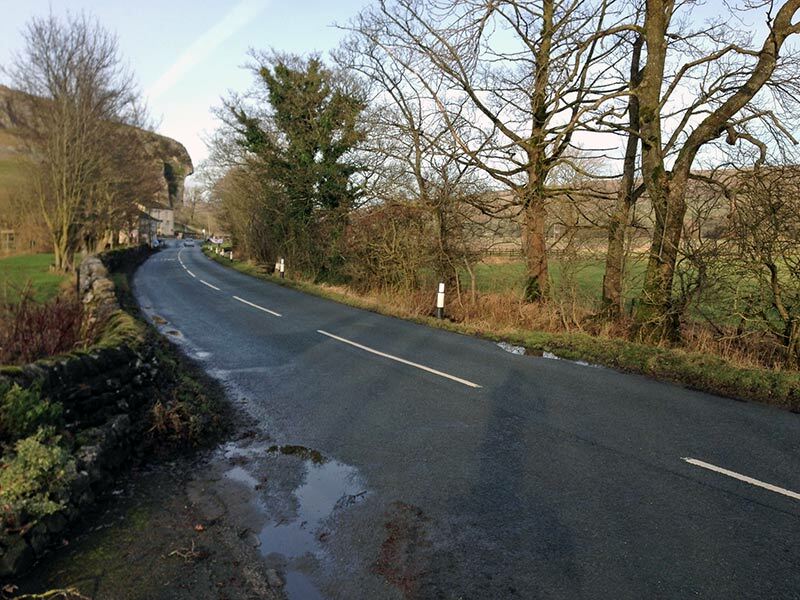 Kilnsey Crag with mud on the road. If you are genuinely going to consider growing a beard and donning full mudguards, read ’round the world on a wheel’ a lovely book, not challenging, but it may put you off.